Republicans and Democrats see little common ground between the two parties when it comes to issues, ideas and ideology. Majorities of partisans say the policy positions of the Republican and Democratic parties are very different, and neither Republicans nor Democrats say the other party has many good ideas. 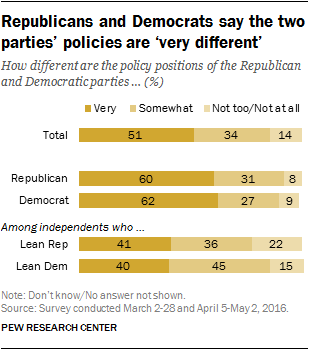 In general terms, both Republicans and Democrats agree with their own party’s policies. In-party agreement extends to specific issues, such as policies to deal with the economy, health care and immigration. However, there are some issue areas – climate change for Republicans and policies to deal with ISIS for Democrats – where somewhat smaller majorities of partisans say they agree with their own party’s approach. Even then, few partisans express agreement with the other party on these issues. Overall, about seven-in-ten Republicans (71%) and Democrats (70%) say they generally agree with their party’s positions almost always or more than half the time. Even larger majorities – 84% of Republicans and 82% of Democrats – disagree with the other party’s positions at least most of the time. Most Republicans and Democrats also agree with their own party’s policies on a range of specific issues, including the economy, immigration, health care and policies to deal with the Islamic militant group in Iraq and Syria. However, the shares agreeing with their own party vary by issue, and the patterns of agreement are different within the two parties. Republicans are less likely to say they agree with their own party’s positions on climate change and abortion than they are to say this about other major issues. Overall, 65% strongly or somewhat agree with the Republican Party’s policies on abortion and 59% say they agree with the party’s approach to dealing with climate change. By contrast, larger majorities of Republicans agree with their party’s positions on illegal immigration (82%), the economy (80%) and gun policy (80%). Among Democrats, the percentage that agrees with their party’s policies to deal with ISIS (67%) is smaller than the share agreeing with the Democratic Party’s stance on issues such as health care (84%), the economy (81%) and climate change (80%). There is little evidence that the other party’s positions hold appeal for Republicans or Democrats, even on the issues for which agreement with one’s own party is relatively low. For example, while a modest 59% of Republicans agree with their own party’s positions on climate change, just 9% say they agree with the Democratic Party’s policies on the issue; a much larger share (29%) say they don’t agree with either party on the issue. 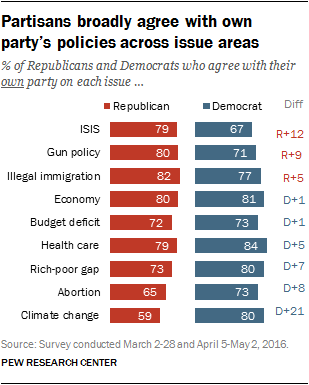 Similarly, 23% of Democrats say they do not agree with either party’s policies to deal with ISIS compared with just 7% who agree with the GOP’s policies (67% of Democrats agree with their own party on the issue). Among Republicans, strong agreement with their own party is most concentrated on the issues of gun policy, illegal immigration and policies to deal with ISIS. More than half of Republicans strongly agree with the Republican Party’s policies on guns (57%), illegal immigration (54%) and ISIS (54%). Strong agreement is lower on other issues – such as the economy (44%) and health care (42%) – yet overall levels of agreement on these issues are comparable to those on gun policy, immigration and ISIS. Democrats express the highest levels of intense agreement with their own party on different issues than Republicans. Overall, 48% of Democrats say they strongly agree with the Democratic Party’s positions on health care and abortion, and 47% say they strongly agree with their party on climate change. Just 29% of Democrats say they strongly agree with their party’s policies to deal with ISIS, while 37% somewhat agree. 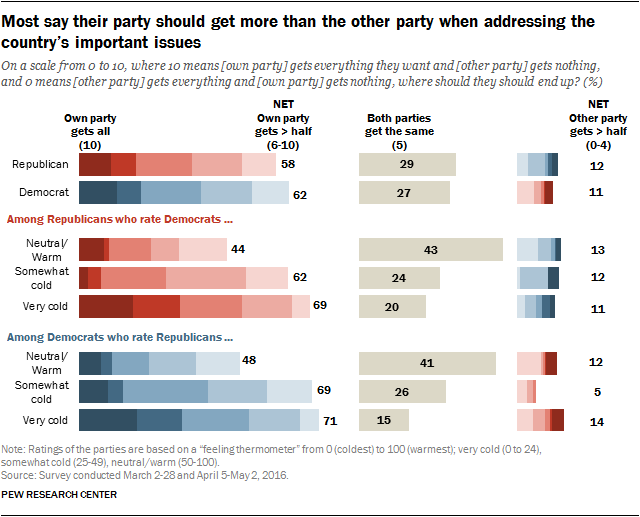 While Republicans and Democrats express different levels of agreement with their own party on specific issues, the overall number of issues on which they express agreement with their own party is similar. About seven-in-ten Republicans (71%) and Democrats (72%) agree with their own party on at least five of the seven issues asked of all survey respondents (excluding the budget deficit and the gap between the rich and poor); about four-in-ten express agreement with their party on all seven issues (38% and 42%, respectively). Relatively few Republicans (18%) or Democrats (18%) agree with their party on three or four of the issues, and just 11% of both parties agree on fewer than three issues. The feelings Republicans and Democrats express about members of the other party are closely tied to their levels of issue agreement with their party. 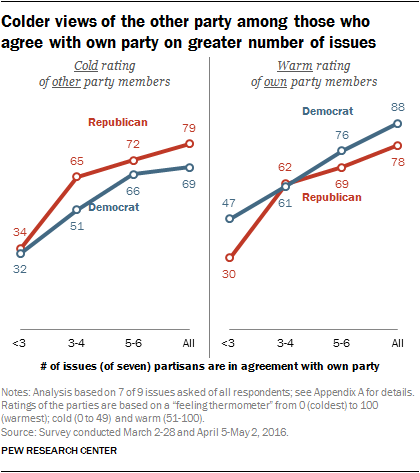 Those who agree with their party on a greater number of issues are more likely than those who agree with their party on fewer issues to give members of their own party warm ratings; they are also more likely to give members of the other party cold ratings on a thermometer scale from 0 to 100. Nearly seven-in-ten Democrats (69%) and eight-in-ten Republicans (79%) who agree with their own party on all issues say they have a cold view of members of the other party. By contrast, far fewer Democrats (32%) and Republicans (34%) who agree with their party on fewer than three issues express cold feelings toward members of the other party. Similarly, 78% of Republicans who agree with their party on all seven issues express warm ratings toward other Republicans, compared with just 30% of Republicans who agree with their party on fewer than three issues. The pattern is similar among Democrats: 88% of those who express across-the-board issue agreement with the Democratic Party have warm feelings toward other Democrats. 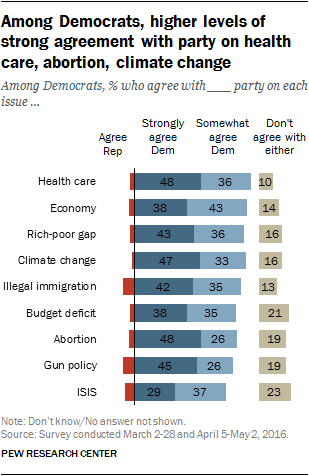 Among Democrats who agree with their own party on only a few issues, just 47% have a warm view of Democrats. 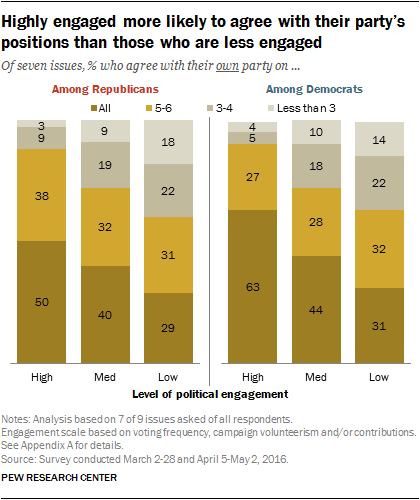 Republicans and Democrats who are highly engaged with politics are more likely to agree with their own party’s positions on issues than those who are less engaged. Among Republicans who are highly engaged with politics (regular voters who volunteer or contribute to political causes), 88% say they agree with the Republican Party’s positions on at least five of seven major issues. Republicans who have medium or low levels of political engagement are less likely to express agreement with their own party on these issues (72% and 60%, respectively). The same relationship between political engagement and in-party issue agreement is seen among Democrats. Nine-in-ten highly engaged Democrats agree with their own party on most of the seven issues, compared with 72% of Democrats with medium levels of political engagement and 63% of Democrats with low levels of political engagement. More politically engaged Republicans and Democrats also are more likely than the less engaged to see large differences between the policies of the two parties and to say the other party has almost no good ideas. How different are the policies of the Republican and Democratic parties? The public sees a clear distinction between the policy positions of the Republican and Democratic parties: About half (51%) say the positions of the two parties are very different, while another 34% say they are somewhat different. Just 14% say they are either not too or not at all different. Partisans are especially likely to see the two parties as holding different views: 60% of Republicans and 62% of Democrats say the parties take very different policy positions. By contrast, those who say they lean toward a party, but do not identify with it, see more modest differences between the two parties. About four-in-ten Republican leaners (41%) and Democratic leaners (40%) say the policy positions of the Republican and Democratic parties are very different. 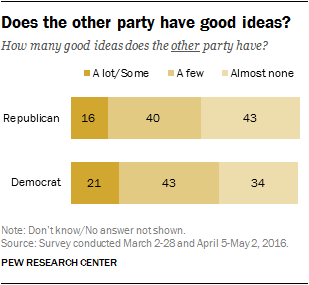 Republicans and Democrats also do not see many good ideas coming out of the other party. Among Democrats, just 21% say the Republican Party has either a lot or some good ideas; 43% say it has a few and 34% say it has almost no good ideas. Views of the Democratic Party’s ideas among Republicans are similarly skeptical: Only 16% say the Democratic Party has a lot or some good ideas, while 40% say it has a few and 43% say it has almost none. Most partisans say that, when it comes to how Democrats and Republicans should address the most important issues facing the county, their party should get more out of the deal. On a scale of 0 to 10, where 10 means their party gets everything it wants and 0 means the other party gets everything it wants, about six-in-ten of those in both parties (58% of Republicans, 62% of Democrats) think their side should get more on the key issues facing the nation. Roughly three-in-ten Republicans (29%) and Democrats (27%) say both parties should get about half of what they want (a 5 on the scale). Partisans with colder feelings toward the other party are more likely to say that their own side should get more. Among Republicans, 44% of those who feel neutral or warm toward Democrats say their own party should get more than half of what it wants on key issues facing the country. That share rises to 62% of Republicans who give Democrats somewhat cold ratings, and 69% of those who rate Democrats very coldly. The same pattern is evident among Democrats. Among those who give Republicans a very cold rating, 71% say Democrats should get more in partisan dealings; 69% of those who rate Republicans coldly say the same. By comparison, a smaller share (48%) of those who rate Republicans neutrally or warmly say their own party should get most of what it wants. Republicans and Democrats tend to view the opposing party as highly ideological, while viewing their own party as less ideological. While most Republicans (71%) describe their party as conservative (0-4 on the scale), just 11% of Republicans select the most conservative option. About a third of Republicans rate their party one of the three most conservative points (36%), while about as many (35%) give their party a conservative rating that is closer to the midpoint (a 3 or 4). Just 16% select the midpoint of the scale (5) and only about one-in-ten (11%) place themselves on the liberal side of the scale. A similar pattern is seen in views of the Democratic Party’s ideology. Fully 45% of Republicans select the most liberal option to describe the Democratic Party, and nearly seven-in-ten Republicans (68%) use one of the three most liberal points on the scale (8, 9 or 10) to describe the party. 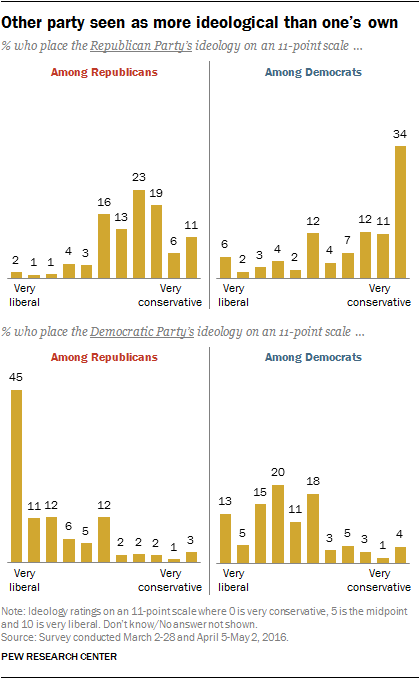 Democrats have a more evenly distributed view of their party’s ideology. Just 13% give it the most liberal score on the scale and only a third (33%) describe the party’s ideology with one of the three most liberal points on the scale. About three-in-ten Democrats (31%) give their party a liberal rating that is closer to the midpoint (a 6 or 7), and 18% place the ideology of their party in the middle of the scale (5); 17% place themselves on the conservative side of the scale. 6. How do the political parties make you feel?